​Oily skin can cause makeup to dissolve quickly! Makeup Setting Spray ensures long lasting foundation, powder & eye shadow. A must-have during hot summer months, special events, and trips to the beach - setting spray forms an invisible barrier without clogging pores. Mattify! Cosmetics is pleased to be a re-seller of Ben Nye's Final Seal Makeup Setting Spray! After application, you will notice that makeup stays in place up to 5x longer. The convenient travel-size containers below will provide about 20 sprays, and the full size 1 oz containers feature a fine-mist sprayer that provides around 100 sprays. 1) Apply all of your makeup as usual, including mascara and face powder. 2) Close your eyes and hold the setting spray bottle about 6 inches away. 3) Visually divide your face into 4 sections, and spray each section. ​simply blot and re-powder with Mattify ULTRA for a fresh, matte look. of stock. Expected to be back in stock by March 16th. The 1 Oz Full Size bottle is NOT available for international buyers (except Canada) due to post office regulations regarding liquid products. We apologize for the inconvenience! International buyers can still purchase the small 5 ml bottle. This rotating sifter top can be placed inside any 20 or 30 gram jar of Mattify Powder, Tinted Foundation, Blush, Bronzer, Highlighter or Travel Size Powder, so you can adjust the amount of powder released. This miniature 1 inch powder puff is sized just right to fit any 20 or 30 gram jar of Mattify Powder, Tinted Foundation, Bronzer, Highlighter, Blush, or Travel Size Powder containers. 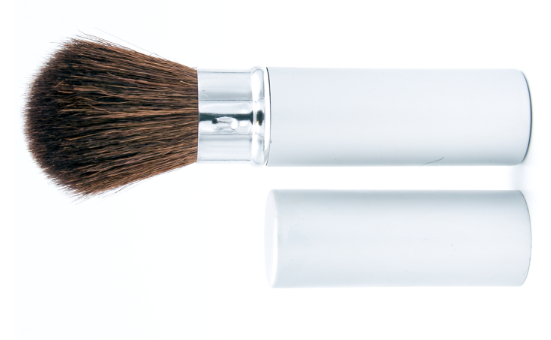 Our Powder for Oily Skin & Powder Foundation glide on seamlessly with this retractable brush. The perfect powder brush to keep in your purse or makeup bag! ​This eye makeup applicator allows our loose powder shadows to glide on flawlessly. Use the pointed tip to apply close to lash line, and the wider base for blending. Use this scoop in place of fingers. to remove product from jars of Incredi-Gel Moisturizer and The Exfoliator. ​When dead cells are allowed to accumulate on the skin, they combine with oil and makeup to clog pores. If pores are embedded with this debris, skin care products can't penetrate - creating a breeding ground for acne bacteria and inflammation.